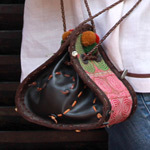 Artisan Chirada Loetparisanyu presents this unique drawstring shoulder bag. 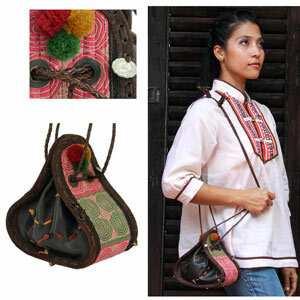 The exterior features green and pink scroll motifs embroidered by hill-tribe people by hand. Coins, beads, pompoms and leather stitching complete the fascinating design. The bag closes by pulling on the braided leather cords. Materials: Leather 65% and cotton 35%. Raintree wood beads.